When I talk about my retirement, the conversation always seems to go to how busy we are. My days are filled with activity. I spend most mornings writing and reading. In the afternoon, I spend a smaller-than-necessary time on keeping house, making supper or going into town on errands. Evenings are divided between time with my husband and writing, attending meetings or working at some of my volunteer work. The weather can change all of this. 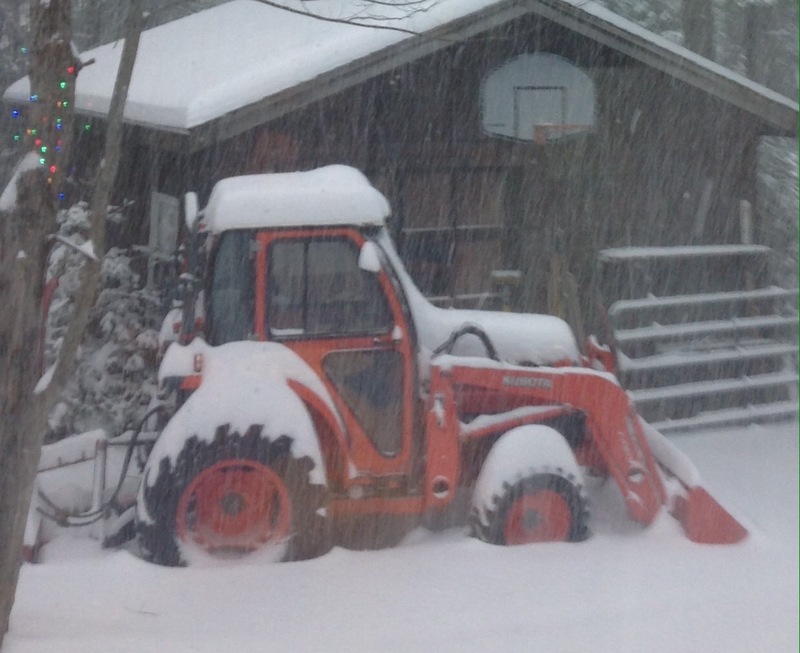 My husband has a 40 horsepower tractor equipped with a front end loader and a snow-blower. On snow days, he plows or blows snow from his customer’s driveways. On these days, I am the ‘support worker’. I answer the phones, keep track of where my husband is blowing snow, deliver diesel when he runs low on fuel and take him his dinner. Our day starts at about four in the morning. 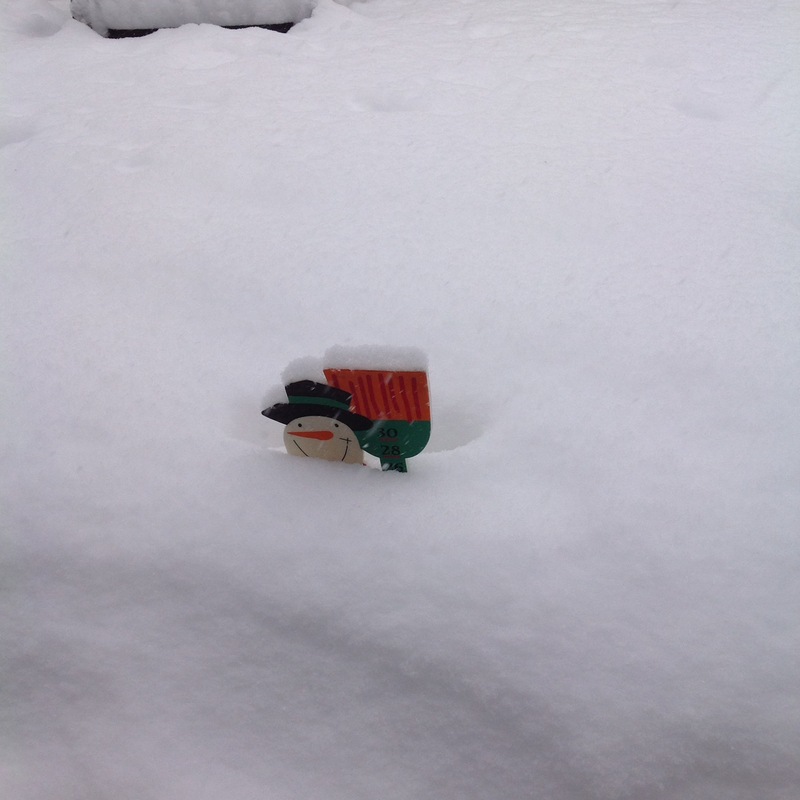 First, the ruler, to measure the fallen snow. Then, the first customer … us! … two passes to make sure I can get the truck out when the time comes. 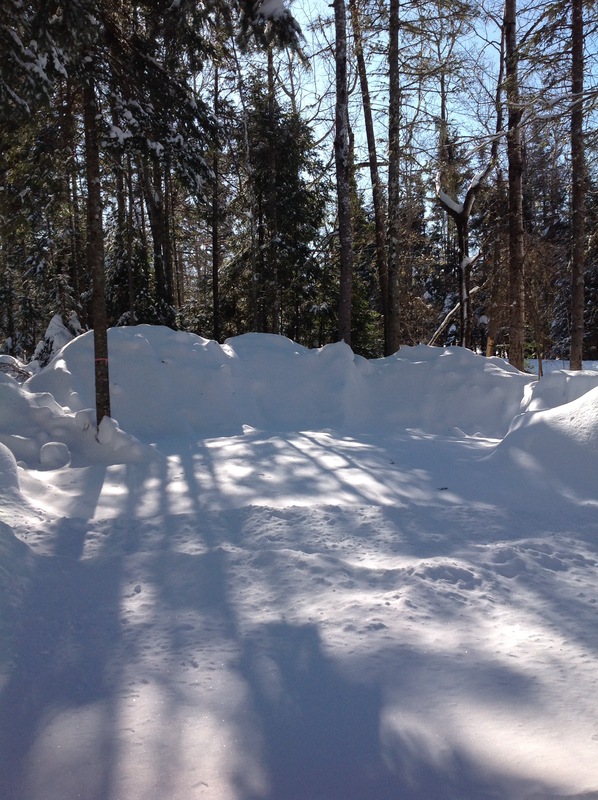 By the time the first refuelling call comes, the truck is cleared of snow, the bird feeders are filled and I have already finished my daily writing objectives. When people complain about bad driving in winter, I can say that I have driven in the worst of the worst. Since most of our 25 or so customers are in the local subdivisions, we are often out removing snow before the side roads are plowed. 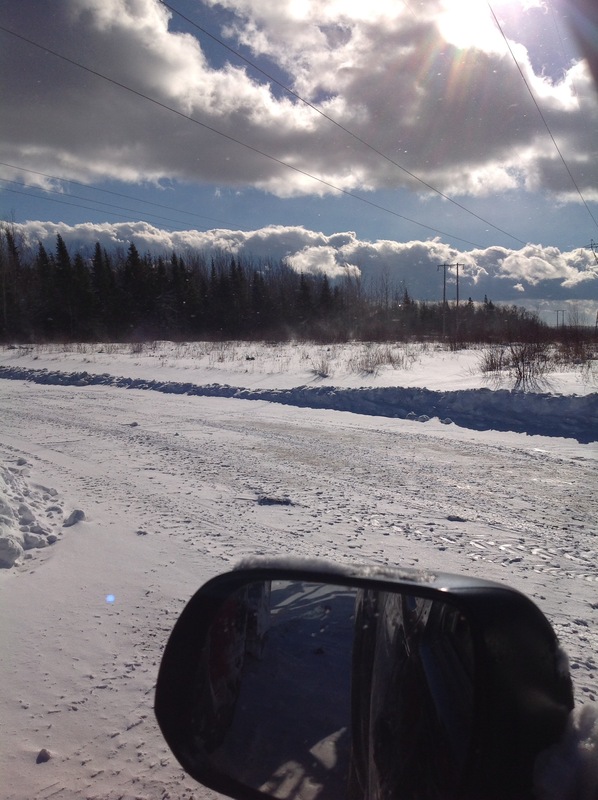 I am lucky to have a four-wheel drive since this winter, snow over ice has been the norm. You might think that writing takes a back-seat to my duties when it snows. But not so. I do a lot of my writing in my head as I go about my work. In the evenings, when I drive out with my husband to collect from his customers, I am gathering writing ideas. For example, a few nights ago, as I waited in the truck, a drone lifted from a neighbourhood yard and tracked overhead … a scene for the novel I am working on was born! Our lives are busy, but I love variety. I love being part of my husband’s day as he goes about his work. When I take his lunch to him, we talk and watch the falling snow and listen to the radio. And wonder where 37 years of winters have gone! ‘writer’ and ‘desk’ … a likely pairing of words … a writer may have many desks, but does the desk have a writer? In our home are five desks, four for me. The desk in my guest room is the neatest, used only for addressing Christmas cards in December. 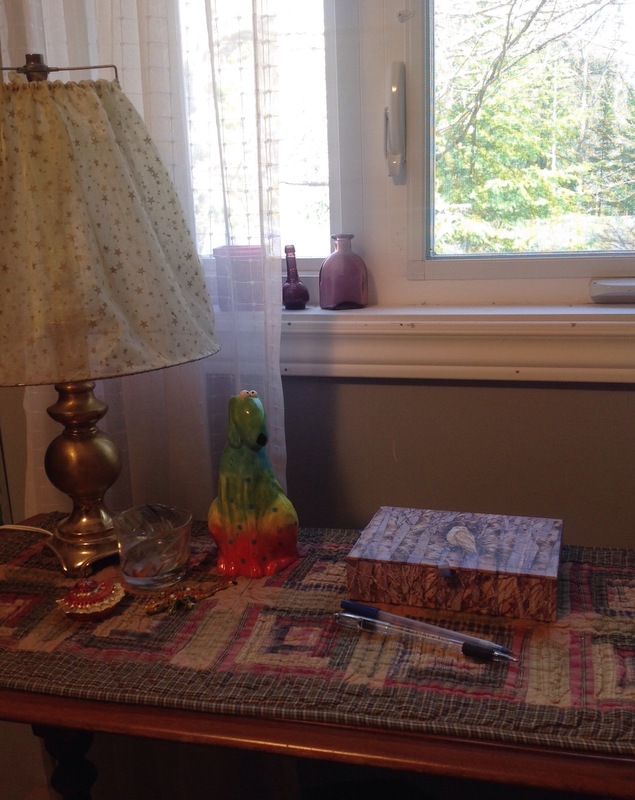 A little desk, it has a lamp, a box of stamps for personalizing cards and envelopes, a ceramic dog that once sat on my desk at work, a tiny gecko bought for me in Milan by my oldest brother, a cloisonné sea-shell from my sister, and a hand-blown glass purchased with my husband in Ontario. Quite by accident, these items are all orange and green. I sit at this desk every morning, to look at the eastern sky and plan my day. I never write fiction or poetry at this desk. The desk in the loft is my official desk. This desk is oval and was given to me by my youngest brother – it originally belonged to my aunt. 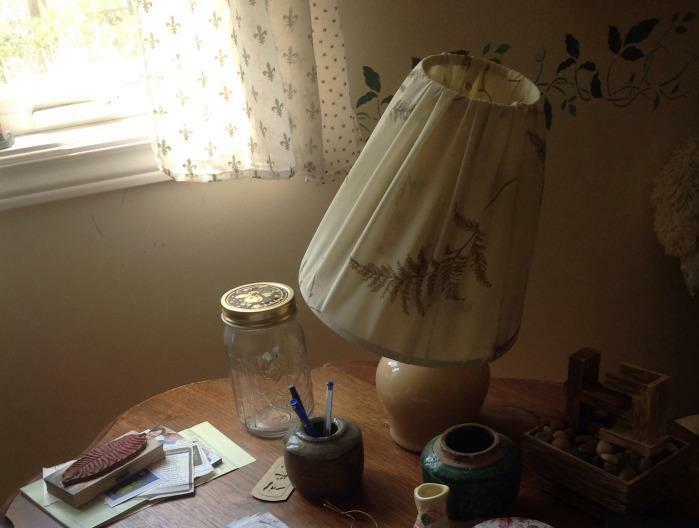 It has a lamp, a small fountain and a jar of simulated fireflies from my son. I keep a few ongoing projects here, including a stack of pages where I store tidbits of information remembered from my life. If I come across a vacation memento or a scrap of paper kept from some event, I record it here. One page per year … 61 so far. This desk is equipped for writing. Nearby is a dictionary, a thesaurus and a keyboard for my iPad. No poems or fiction, however, are written at this desk. This is the desk I clean when I haven’t written for a while. My third writing desk is oak, very old, and has a leather top. This desk holds a lamp, my computer and printer, the modem, and a USB dock for e-books, iPad, camera, Bamboo drawing surface, and a small USB-driven fan for warm days. Add a wonky stack of paperwork, sorted at tax time, and a mouse with 2 square inches of space to manoeuvre. This desk is always a mess, has no space for pen and paper, and somewhere in the desk drawer is a Tamagotchi that hasn’t been shaken in fifteen years! 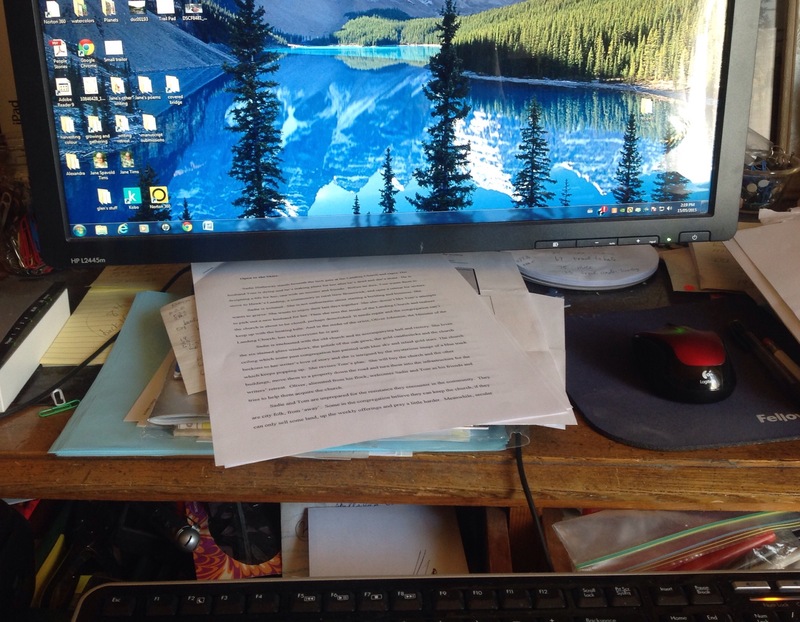 Lots of poems and thousands of words of fiction are written at this desk … not so much written as pecked out, in three finger combinations. My fourth desk wouldn’t get a mention in a furniture inventory. It is a beaten-up plastic lap desk, scavenged from my son and re-covered (it used to have a dinosaur pattern) in a fern-patterned fabric. This is where my pen and paper writing gets done, usually in my living room chair, sometimes at our camp and occasionally outside in our yard. It has room for my rough book and a small ledge to hold a pen. It never needs tidying and slips neatly into my writing bag. It has supported the writing of poems, books, blog posts and letters. I love my lap desk. Do you have a writing desk or desks? Where do you prefer to write? For a writer, spring is often a time for attending writing workshops. 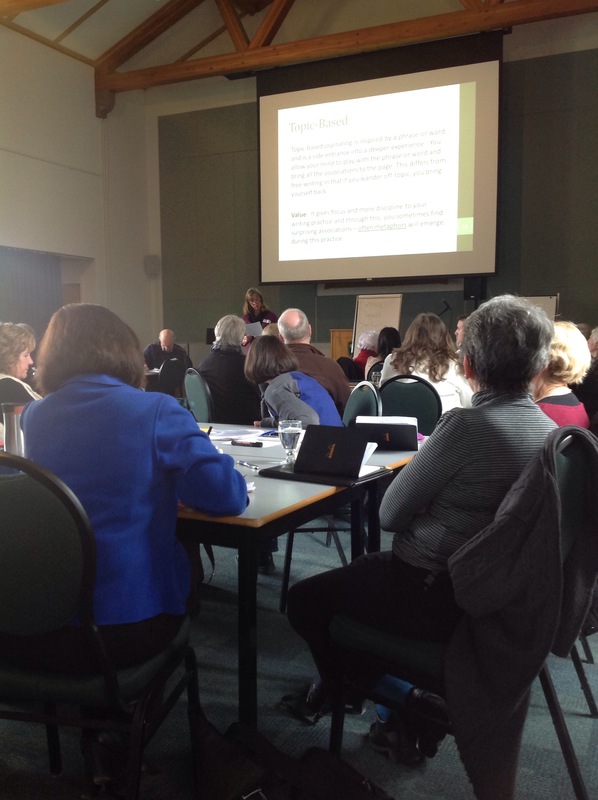 Last month I attended part three of a workshop about writing life stories. In the next couple of months, I plan to attend short courses as part of the Writers’ Federation of New Brunswick’s WordSpring weekend, and a workshop about nature writing ( http://www.natureofwords.com/writing-workshops/write-in-nature/ ). Partly because my current fiction project ‘Crossing at a Walk’ is about a writers’ retreat, I have been thinking about the spaces where writing workshops are held. I have attended workshops at hotels with comfortable meeting rooms and lovely gardens. I have also been at workshops in huge community auditoriums and cosy private homes. One year my writing group went to a retreat at the Abbey in Rogersville in eastern New Brunswick and experienced simple dormitory surroundings in a very spiritual setting. I think the most variable aspect of space in the writers’ workshop is the ‘chair’. Some are comfortable, built to allow both body and mind to relax. At one workshop the designer chairs were so flimsy, I spent the entire time worrying I would fall to the floor! Although I have attended many workshops on writing, in many different spaces, I continue to benefit from these experiences and to learn more about the craft of writing. Every workshop facilitator or leader offers a unique perspective on approaches to writing. It is rare for me to leave a workshop without some new technique or method for improving my writing. Writing workshops cover a variety of themes. I am a writer of poetry and fiction, but I have received some of my most valuable training from workshops about writing screenplays and non – fiction. Learnings can be so simple, obvious even. For example, it seems I have to be reminded, over and over, to try techniques such as writing from the perspective of various characters. Workshops create an opportunity to meet other writers. Meeting old and new friends and renewing past acquaintances is a constant source of inspiration for me. The workshops I attend contribute to my own history of being a writer and demonstrate my interest in the writing community and in improving my skills as a writer. Even retired, I continue to build my resumé since publication and grant applications are an important part of my writing life. Hot or cold, noisy or quiet, on chairs designed to break backs or to summon comfort, the workshop space itself can be a source of experience and inspiration. A lot of those chairs, cold spaces and pinging echoes have found their ways into my writing. For some reason, the places I encounter on the drive home from a workshop also make it into my poems. 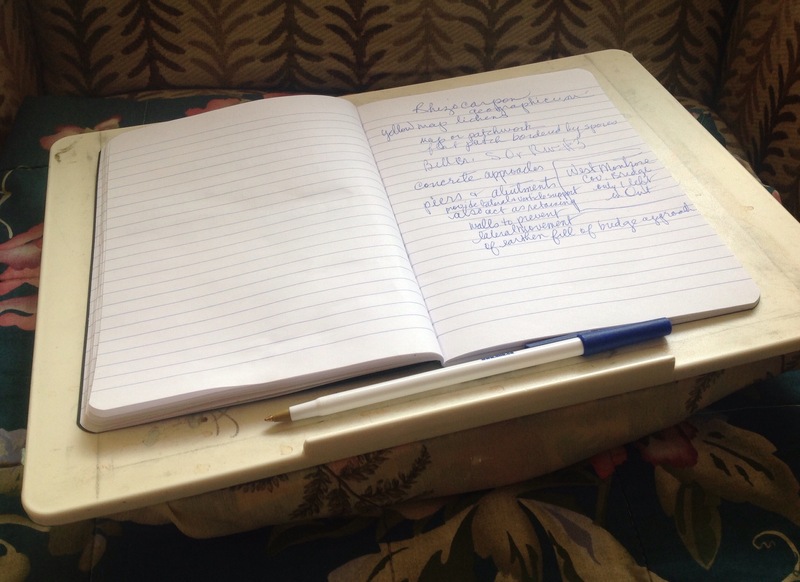 Have you attended any writing workshops and has the workshop space influenced your writing for better or worse?